At the beginning of this year, the lovely Aurore contacted me to illustrate the new identity for her travel & lifestyle blog On My Tree. I had a lot of fun to work with her to develop her new logo and different visual elements for her blog. 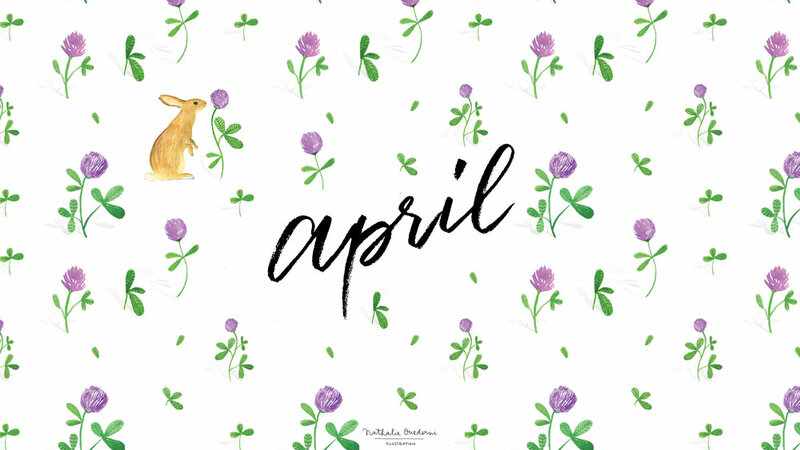 Floral elements, watercolor and animals, these were a few of the key words she mentioned in the responses to my branding questionnaire I sent her when we started on the project, and I was so happy to be part of it. You can read a bit more about this new blog identity in this blog post. Thank you again Aurore for trusting me in creating your blog's new look! Je ne vous en avais pas encore parlé mais il y a quelques mois j'ai eu le plaisir de travailler avec Aurore du blog Voyage & Lifestyle @onmytree pour sa nouvelle identité visuelle ! J'ai eu énormément de plaisir à travailler avec elle pour développer un logo et différents éléments visuels pour son blog proche de ce qu'elle recherchait. Des éléments végétaux, de l'aquarelle, des animaux, voici ce que recherchait Aurore et j'étais pile dans mon élément ! Pour en savoir un peu plus, vous pouvez lire l’article dédié à sa nouvelle identité ici-même. Merci encore Aurore de m’avoir fait confiance ! It's been a long time I haven't published a wallpaper for you, so I made this quick and simple fall pattern yesterday so you can use it on your phone or on your desktop. October is a month I enjoy a lot and I am looking forward to go to the forest and get some chestnuts! Hello everyone! I hope you started this month of April with lots of sun! I decided to introduce something new here, something I haven't done before, even though I would have liked to do this before, but my laziness for writing always found better things to do. This month, I would like to go back and reflect on last month, the projects I worked on. Otherwise I feel like time is passing by so fast that it will be the end of the year again with the impression of not accomplishing anything. So, March was quite a busy month for me, with a lot of beautiful projects I worked on. I started the month working on a beautiful commission for someone who purchased three of my whale illustrations (you can find them here), and wanted a fourth one all about sea shells and starfish. At the same time, I was working on a set of 6 illustrations of birds for a magazine. A beautiful project I was very happy to work on! If you would like a special illustration, please contact me at nathalie@studiokalumi.com, I am always happy to work on special projects! Just want to add a note before leaving you with the downloads of the month.. Sometimes I receive emails asking me if people can use my wallpapers, illustrations they find on my Etsy shop, etc. for printing on postcards, for a book... For a BOOK... and offering to just credit me by putting my name... So just to be clear, taking illustrations of people from the internet without retributing them is not cool, so please respect the work of the artist that is making this and trying to make a living out of it. Thank you! Now it is time for the desktop download of the month! I hope you like it! March is already here, and here comes with it spring, new growth, and a new desktop wallpaper for you! I hope you will like it!